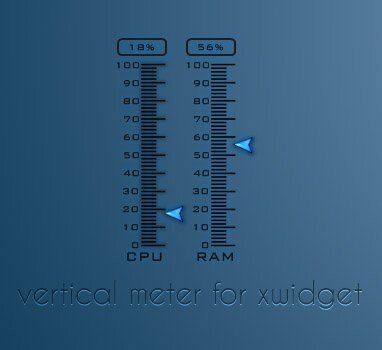 Vertical Meter is nice looking CPU and RAM Meter Gadget for Windows PC and it runs on XWidget Engine. Light Meter looks like analog scored meter system with a floating pointer. Vertical Meter gadget is developed by boyzonet. Previously we posted a post on XWidget. You need to install xWidget from that previous post for this one. Download and double click to install Vertical Meter. It is a RAR download, 66 KB in size. This Article Has Been Shared 5428 Times! Hand Written Notes Widget for XWidget is a nice realistic sticky note widget with realistic effects for Windows 7 PC. Cite this article as: Abhishek Ghosh, "Vertical Meter : CPU and RAM Meter Gadget for Windows PC," in The Customize Windows, February 24, 2012, April 18, 2019, https://thecustomizewindows.com/2012/02/vertical-meter-cpu-and-ram-meter-gadget-for-windows-pc/.